The Online Learning Consortium (OLC) has introduced a series of original reports to keep people in education up-to-date on the latest developments in the field of digital learning. The first report covers accessibility and addresses both K-12 and higher education. The series is being produced by OLC's Research Center for Digital Learning & Leadership. 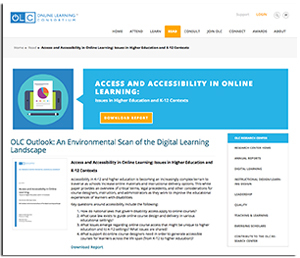 "As our first OLC Outlook report explains, accessibility in K-12 and higher education is becoming an increasingly complex terrain to traverse as schools increase online materials and instructional delivery options," said Jill Buban, senior director of research and innovation for OLC, in a prepared statement. "This report examines the critical terms, legal precedents, and other considerations for course designers, instructors, and administrators as they work to improve the educational experiences of learners with disabilities." As the first report concluded, college and K-12 considerations come into play at multiple levels: institutional, department, program and course for higher ed; and federal, state, district, school and classroom for K-12. But at no level has there been a sufficient push for increasing accessibility to "stave off complaints, legal actions, and high attrition rates for students with disabilities." All reports in the OLC Outlook series will be available through registration in the OLC Research Center for Digital Learning & Leadership.